← Stay on top of your passwords. Get a password manager! Apple was innovative, turning its face on the drab Microsoft 2-dimensional world of MS-DOS and under the genius that was Steve Jobs and partner Steve Wozniak produced the first GUI long before others knew that Windows’ was nothing more than what you looked through. Apple has innovated to a point but now sadly has stagnated. Fact. Since the sad death of Steve Jobs in 2011 to cancer, I believe Apple has failed to innovate and just seems happy in reproducing slightly better models than the model before, such as the iPhone 4 and 4S. Most of the improvement on later Apple models is down to not direct innovation by Apple, but more of advances in silicon technology, such as the Samsung chip used in them! The fact is that other companies have caught up with the early lead that Apple’s innovation originally created, some, such as Samsung with the Galaxy S3 are even surpassing Apple and iOS with the hugely popular Android platform. What has made matters worse for Apple is that they have been heavily been reliant on the component manufacturers, such as arch rival Samsung who fabricate the A6 processor. The recent law suits between the two giants has damaged Apple especially, having lost appeals on copyright and user interface designs. To be honest it’s not just Samsung that has hit Apple hard, it’s the fact that the market is saturated with phones, why should someone upgrade from a perfectly good iPhone 4S to an iPhone 5 for just a bit taller screen? Okay its 4G, can you get that in your area? What Apple needs is to innovate again. Concentrate on producing truly unique products that beat the mainstream, this is what Steve Job’s philosophy always was. 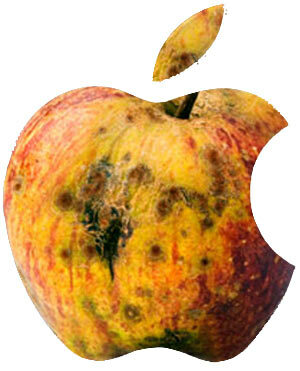 Apple has become a stagnant monolith run by accountants, marketing managers and so forth. It needs inspirational engineers again that think out of the box and create truly inspirational products that users want. Finally, get shot of the current CEO of Apple, Tim Cook. Sure he is a nice guy and clever too, but he’s an opp’s manager, not an engineer, visionary or may I say it, a dreamer. As the famous 1997 Apple poster campaign had as its strap line, this is what it needs to do again – THINK DIFFERENT!